30 Minute Money Machine is a three-part video course that promises to teach you how to make money by creating video reviews of affiliate products. This product sheds some light on a method that might be good for beginners with no budget and a little time to invest in making it work. It’s a good idea, but its returns aren’t going to add up to very much. 30 Minute Money Machine is very similar to another product I reviewed recently. That product is called Affiliate Jackpot Cash. There’s not much difference between the two, except that Affiliate Jackpot Cash goes into much more detail about the whole process. For example, you will learn more about importance of, and how to find good products to promote, as well as learning more about YouTube and Google Hangouts. Both products are the same price, but 30 Minute Money Machine is definitely the inferior product. It combines three videos for a total of nineteen minutes, whereas, Affiliate Jackpot Cash is almost two hours long. If this tactic is something you would like to try out, I would definitely recommend Affiliate Jackpot Cash over 30 Minute Money Method. Sorry Mark. If there's one thing that I really like about 30 Minute Money Machine, it's that it's a truly beginner friendly strategy. What this product suggests is quick and easy to do, and it doesn't cost anything, except for a little bit of time. 30 Minute Money Machine suggests using Google hangouts to create video reviews for affiliate products. The idea is that by setting up a live Google hangout your video will get placed on the first page of the search results whenever someone searches for a review of that product (”product ‘x’ review”). All you have to do is create a video review and hope for enough search engine traffic to make a few sales. These video reviews are really easy to do and most of them only take a few minutes. If you're new to affiliate marketing, or thinking of getting started in it, this is definitely an easy way to get started. Using Google hangouts allows you to create free videos. If you have a webcam then you can create a combination of screen recordings and webcam videos. This saves you from having to buy expensive screen recording software. And if you don't have a webcam you can just use Google hangouts screen recording feature. The benefits Mark says you get in the search results aren't necessarily true, but I'll get to that in the minute. For now, I'll just sum this up by saying that I think this is a good idea for most beginners who are looking for an inexpensive way to get started in affiliate marketing quickly. Alternatively you could use free screencasting software like screencast-o-matic. Although I liked the idea, I see two very big problems with this product. In his first video, Mark suggest that creating Google hangouts will give you some sort of boost in the search results. As you might already know, being on the first page of the search results, for just about any searched term, can mean that you receive a lot of traffic. Obviously, you can turn some of that traffic into sales with a little work. Unfortunately, you don't necessarily receive a boost in search results, simply for creating a live Google hangout. What Mark, and many others don't understand, is that Google serves up personalized search results based on each person's previous searches. You have the option to turn this feature on and off as you want. However, what Mark shows in his videos (and what he suggest to you) is based on his personalized results. That essentially means that what he sees in his search results is what he wants to see. What this all boils down to, is that unless somebody else out there has almost-identical searching habits to Mark's, they might not see his video on the first page of the search results. In order to get anything, including a video, on the first page of search results it takes a little time. Unless you're looking at personalized results. YouTube does offer some advantages just because videos rank and there's no other service as popular or trusted as YouTube. Videos do get preference, but there's no indication that a YT vid will get better rankings if it's created in Google Hangouts (they are uploaded to YouTube automatically after finishing the recording). One of the key problems I noticed with this product is the lack of support. If you have ever read any of my other reviews you will know that I place a high amount of importance on support, especially for products aimed at newbies. However, this is one area where a lot of products fall short. 30 Minute Money Machine is no different. Once you’re taken to the page where you can access your purchase, all you get is three videos — that’s it. There is no support link, email addresses, or any other way to communicate with Mark or anyone else. All you get is the videos. He could have easily included a link to a Facebook page, his email address or some other way to contact help. But Mark chose not to do that, probably because of the effort it would take on his part. Bad move Mark, you should always be willing to put in time and effort for those who have trusted you and invested in you. Despite search engines being the most ideal source of traffic for new reviewers with little or no budget, they take time and you have to build up trust. I don’t want to turn this review into an advanced SEO (search engine optimization) tutorial, so I won’t explain everything here. Just understand that search engines, especially Google, don’t allow just anything on their first page results. Those results are typically given to content that is deemed fresh and trustworthy. That’s why blogs are so popular: they’re constantly creating new content and they tend to have loyal audiences. You can’t simply create a few videos and receive instant first page results. That is even more true for more popular phrases/products. If you’re going to create review videos that receive lots of search engine traffic then you’re going to have to create a lot of them. It will take some time before you start seeing traffic, and a little more before you start seeing sales from your efforts. What I’m getting at is: This isn’t going to happen overnight, and it certainly isn’t going to happen in thirty minutes. Though this is a negative review of 30 Minute Money Machine, I do write some positive reviews. Sometimes I even create YouTube videos for those reviews. They make the occasional sale, but they simply do not convert as well as the written reviews. People love to watch videos, then skip to the next video. It takes a lot of (relative) effort to scroll down below the video and look in the description box to click a “buy now” link. Plus, fake reviews will be obvious since there are so many others doing it. In fact, A LOT guys base their entire business model on launch jacking. They write reviews weeks before the products come out, just providing fake information based on what the sales page says. So you've got a flooded market with scammers, lots of low quality products to sift though in order to find good ones, and a low conversion rate. I really don't think that 30 Minute Money Machine generates profits as easily as suggested. 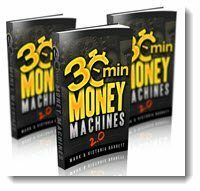 It's important that you understand that 30 Minute Money Machine covers just one aspect of online business. However, it's only one tactic — not a full business plan! It is one small piece of a much bigger picture. Without an existing business, website, or sales funnel, you can't actually profit from learning what they are trying to teach. If you want to actually build a real business online from ground zero, join this online community where you can get step by step training and personal support from professional internet marketers, including myself. It's an environment that has produced many success stories for almost a decade now. Thanx for reviewing the product. i really liked your review here…. to many products promise the moon and the stars…. Yes, way too many products! Top 10 Toddler & Baby Affiliate Programs To Earn Money For Their College Fund! Can You Really Make Money With Instagram?